Skincare must be one of the most written-about subjects, and the info out there is daunting, especially if you don’t know your retinols from your salicylic acids. How do you know what to put on your skin when every ad, magazine and website is telling you something different? Though we love trying out new and innovative skincare products, we believe that the basics are most important – a good cleanser to remove dirt and impurities and a great moisturiser to hydrate the skin. Once you’ve got that down, determine which ingredient will solve your woes (and give your skin exactly what it needs!). We’re on a mission to simplify skincare – one ingredient at a time. Today we take a look at vitamin C.
Vitamin C is celebrated for its potent antioxidant properties – by now you would have heard that free radicals are one of the leading causes of ageing and skin damage. Antioxidants, and in this case, vitamin C, fight and neutralise free radicals and help counteract their effects on the skin and body. Not only do they prevent future damage, but they stimulate collagen production and help repair damage that’s already been done. They are also brilliant pigmentation fighters. 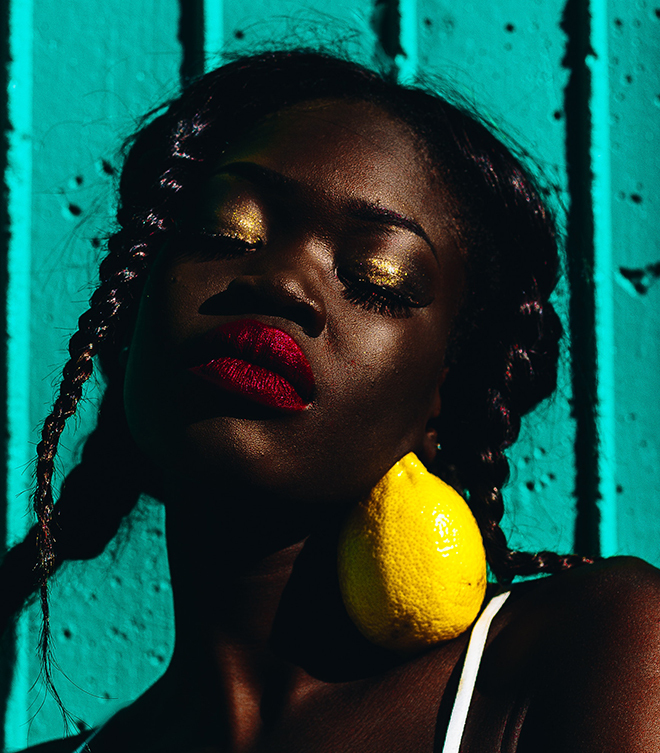 Vitamin C helps to inhibit the enzyme tyrosinase (a catalyst that aids melanin production), thereby helping prevent melanin production. Plus, it significantly lightens already-present pigmentation. Vitamin C is available in many percentage and composition varieties because of the likelihood of irritation that may occur. It’s best to consult your therapist or dermatologist before using a vitamin C product to ensure that you don’t start off with a strong formulation that may have an adverse reaction. Vitamin C performs best when used consistently, so if you find a product that works for you, use it religiously to reap the rewards. 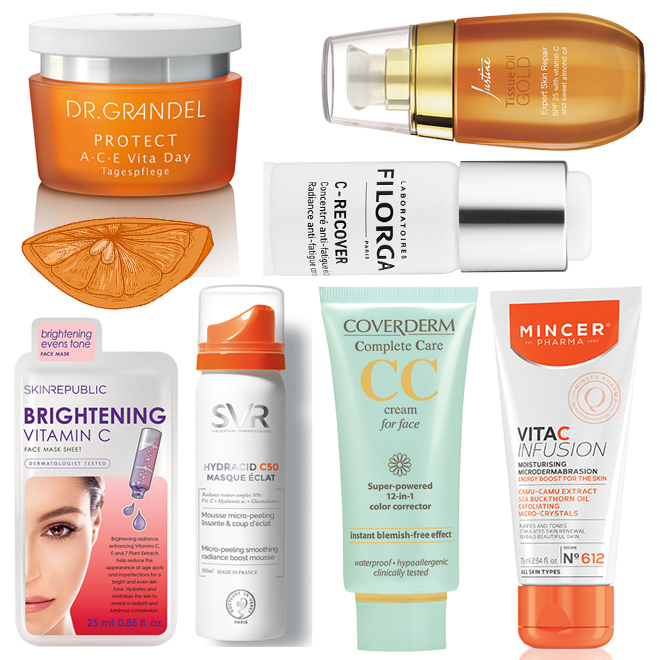 Always be diligent about applying an SPF as vitamin C may make the skin more vulnerable to UV damage. The beautifully soft day cream revitalises and preserves the youthful freshness of the skin. The finely encapsulated vitamins and special DNA protection work against environmental strains and premature skin ageing, and results in a lasting glowing complexion. This is a great product to add to your regimen if your complexion is a bit lacklustre or dull. This sheet mask adds a radiant glow to damaged skin. Ingredients such as Vitamins C and E and seven plant extracts gently reduce and even out imperfections in the skin, or natural spots such as freckles or age spots. Plus, we love how a sheet mask reminds us of going to the spa – it’s a great way of taking some time out at home. Tissue Oil Gold is formulated with Justine’s highest concentration of oil soluble vitamin C. This intensive treatment is easily absorbed into the skin and is effective in helping to even skin tone, improve the appearance of wrinkles and protect skin against sun damage. We love this oil for both its antioxidant and nourishing properties – it has all the hydrating qualities of the original Justine Tissue Oil we love. A highly concentrated treatment that boosts cellular activity, evens out the complexion and reduces wrinkles. The perfect boost for tired, stressed and dull skin, this powder contains 8% pure vitamin C. Due to the nature of the formulation it must be prepared just before application, and once prepared, the preparation can only be kept for a week. The results? Delayed ageing, stronger collagen production, minimised fatigue lines and a boost of brightness of the skin. Hydracid C50 is a micro peeling foam mask described as pure vitamin C in a can. An innovative product, which, for the first time has made it possible to include such an ultra-high concentration of active Vitamin C. It takes just 15 minutes of this product on the skin to improve radiance, texture, hydration and plump the skin. We love the extra touch of delicate citrus scent – it smells lovely on the skin. This colour correcting cream contains 26 active ingredients to even and brighten skin tone, nourish, moisturise and soothe the skin. It protects against UVA & UVB rays and treats wrinkles, blemishes and irritation. The face cream also controls sebum, tightens pores, and treats facial redness. Available in four natural shades, it is non-oily and contains an SPF25. This is a great “everyday” multitasking product as you can wear it as a foundation while enjoying all the benefits it has to offer. Suitable for all skin types, this scrub can be applied 2 – 3 times a week to gently exfoliate, refresh, oxygenate and smooth the skin. It provides an energy boost while purifying and stimulating cell renewal. This is the perfect complement to a vitamin C serum or moisturiser.